aptly named for its existing plan shape, this ranch sits at the edge of vineyards in northern Napa County. This is the youngest house we’ve ever brought to the studs – built in 1988. Back then I was walking to the corner store with a friend, buying Cool Ranch Doritos and hearing Sweet Child O Mine croon from the radio as I passed by fields of the upstate NY type. (maybe this should be called Cool Ranch?!) the house is well-built and was cared for, but it just needs a little jolt from us to kick up the dust and bring it to 2016. Axl is still trying to make it happen but that doesn’t mean this house has to. 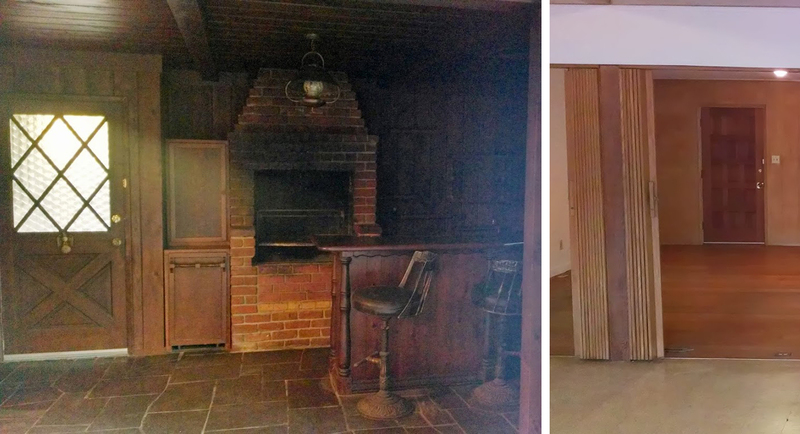 one of the cool things about this ranch is that it came with original blueprints. hand-drawn plans and details! as you can imagine, one of the first things we thought of was to vault the ceilings and really appreciate / experience that gabled roof shape, from inside. 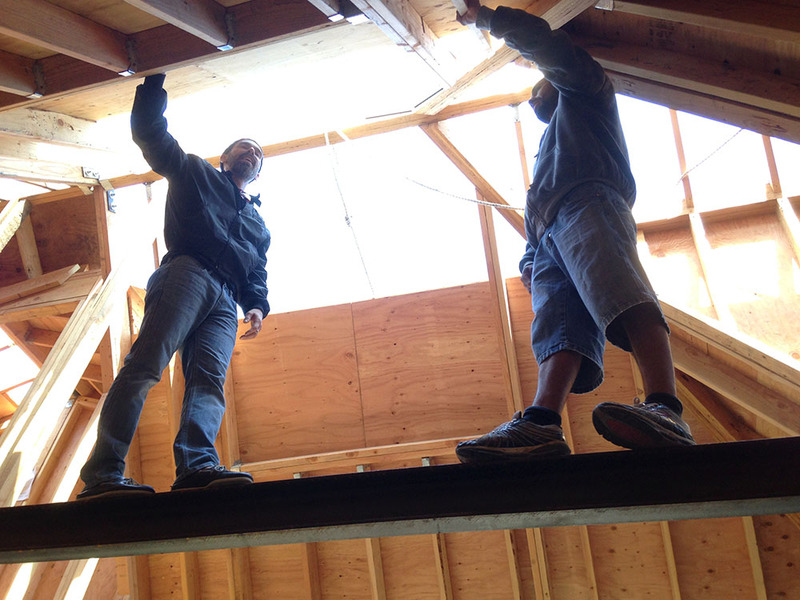 that means removing a ton of trusses, 24″ o.c. … it’s a lovely location. the first thing you see from the road is the garage door, none of us like this but it has stay – only getting a makeover. 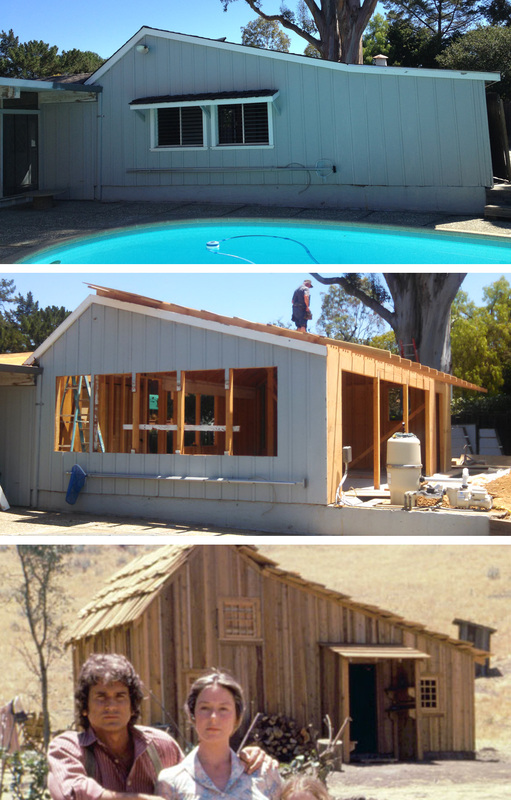 below are a few more shots around the outside. where’s the front door?! tons of butterceam yellow, eek – I really only like this on a cupcake. it’s really weird to me to see massive roofs leaning on spindly little posts. like I said, the house is ‘nice’ but isn’t living up to its potential in this location. out in the back is the water tank building. around wine country you often see old water towers, with the tank at the top. this property has two wells. we’re looking toward the rear yard, from where large doors will be located. inside is just, blah. 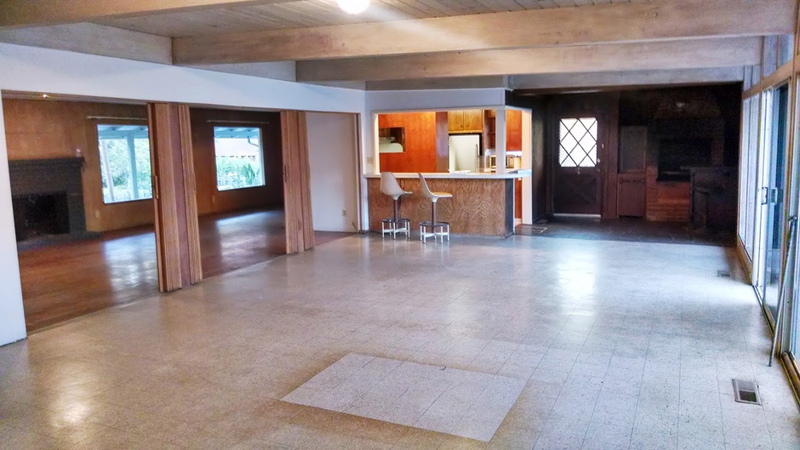 finishes aren’t amazing, flat ceilings throughout, gigantoid fireplace and concrete hearth. sidenote: there are some brass faucets that were hot in ’88 and despised until a few years ago. it’s all cyclical. here are a few proposed renderings, showing the new entry and vaulted ceilings with rafters. 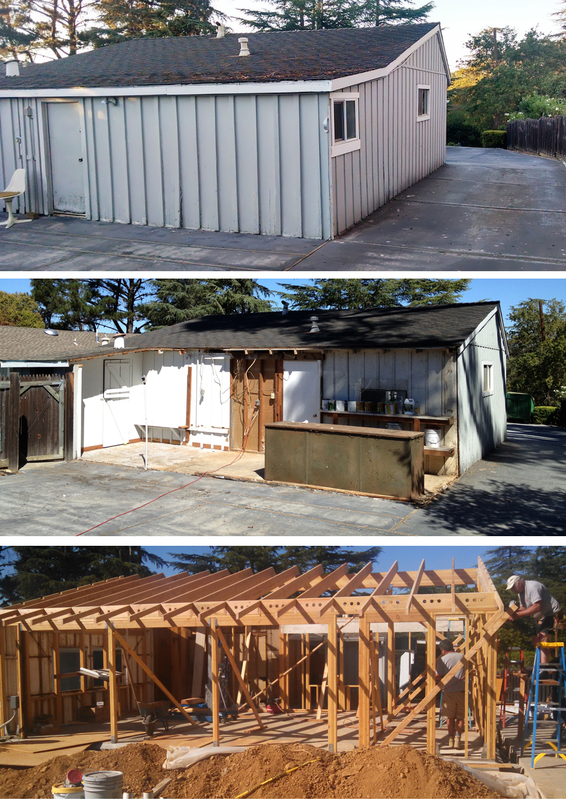 below are some more recent shots of what’s been going on: from underwhelming entry to chopped off entry! the cupolas are staying, a client decision that I think is a good one. 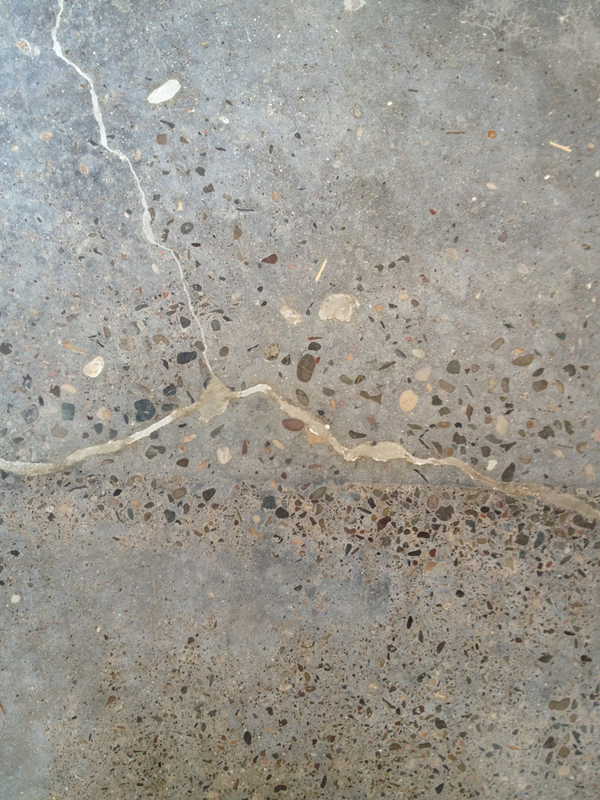 photo on the left above is a slice through the house, at the boomerang ‘elbow’ where the new main entrance will be. see one of the wells in the foreground. 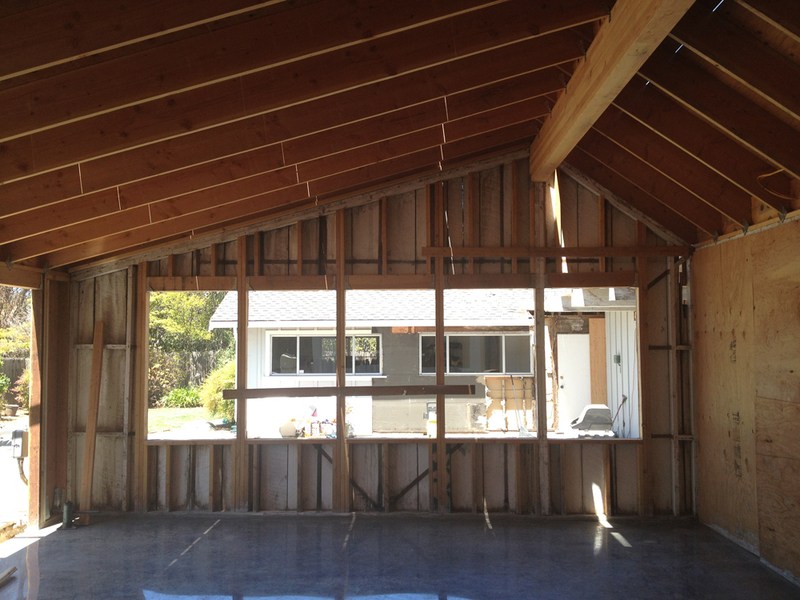 on the right, to the studs: the future dining / living area and soon to be removed trusses. 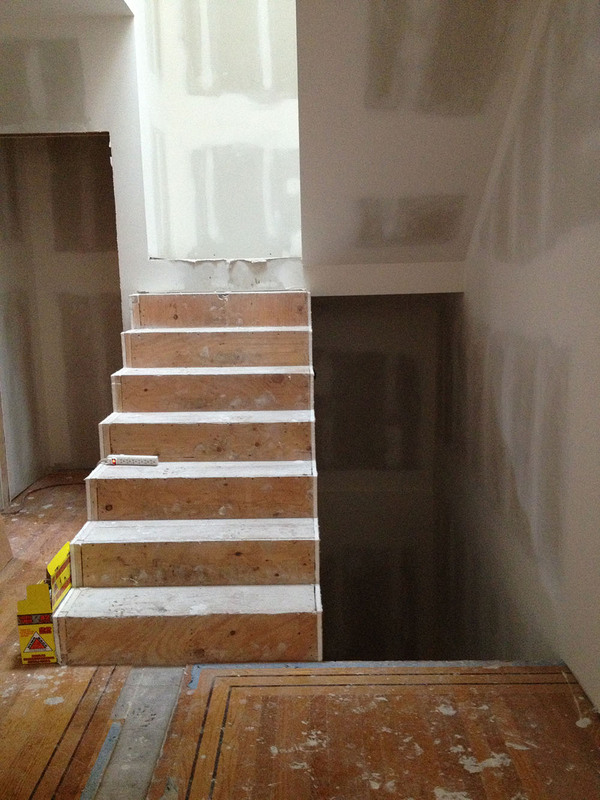 at the back / north end of the house will be the master bed & bathroom. the photo below is the stunning vineyard view directly across the street when leaving the driveway. this is why I’ve always said I feel like I can finally breathe when I get into the country – air, space, light, views, nature. stay tuned, more to come! I thought I’d start with this image although taken some time ago, is a little indicative of my daily work experience. i.e. balancing my workload high above everyone’s heads with imminent danger (drama) looming, sometimes in my sperry top-siders and members-only jacket, but usually in plaid. It takes stains better. yuk yuk yuk We’re on one of two steel c-channels that form the ‘bridge’ in this house. 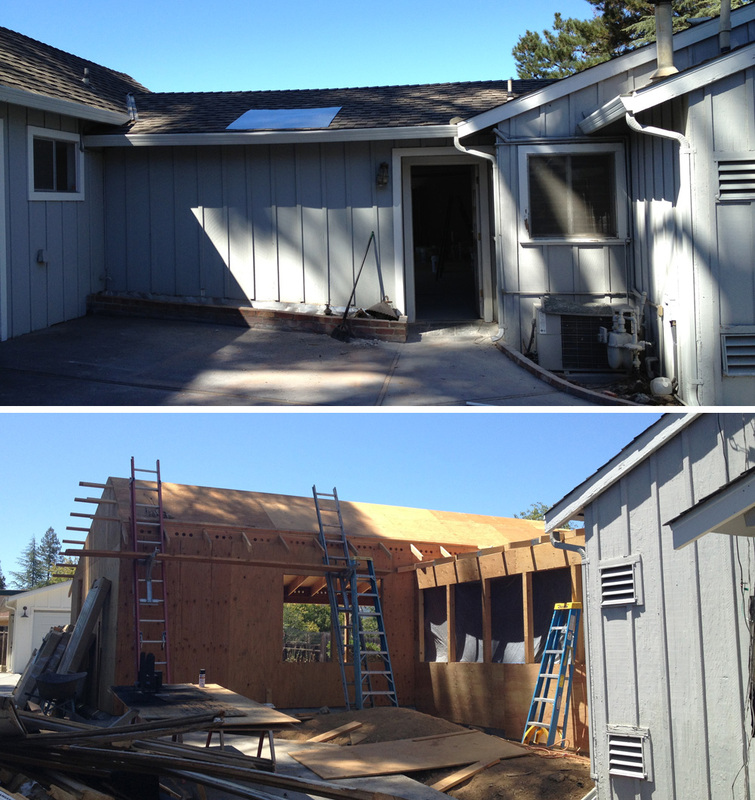 A few weeks later it looked like this once all the sheetrock was in place, looking toward the back of the house. 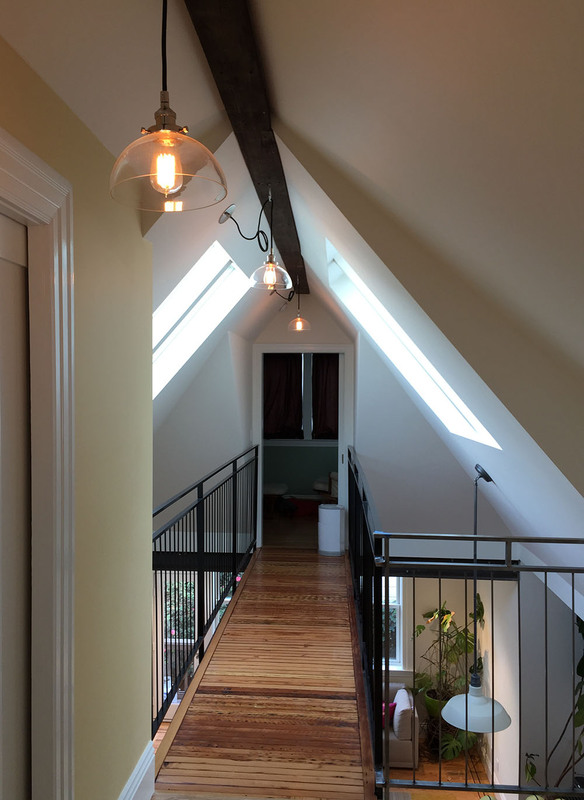 We’re all really excited about this element / focal point of the home, and as mentioned in an earlier post we reused attic redwood framing to make the walkway of the bridge. 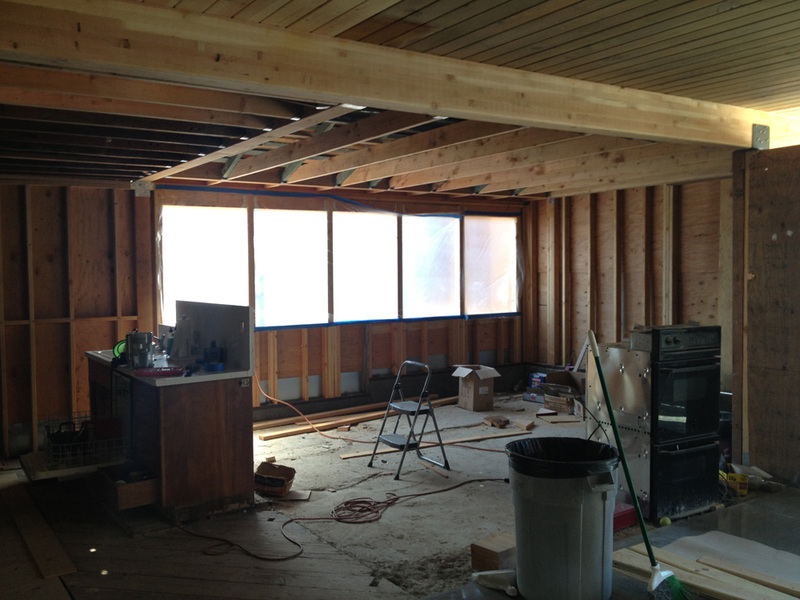 A view looking in the opposite direction at the kitchen, some cabinetry installed, and the front door off to the left. 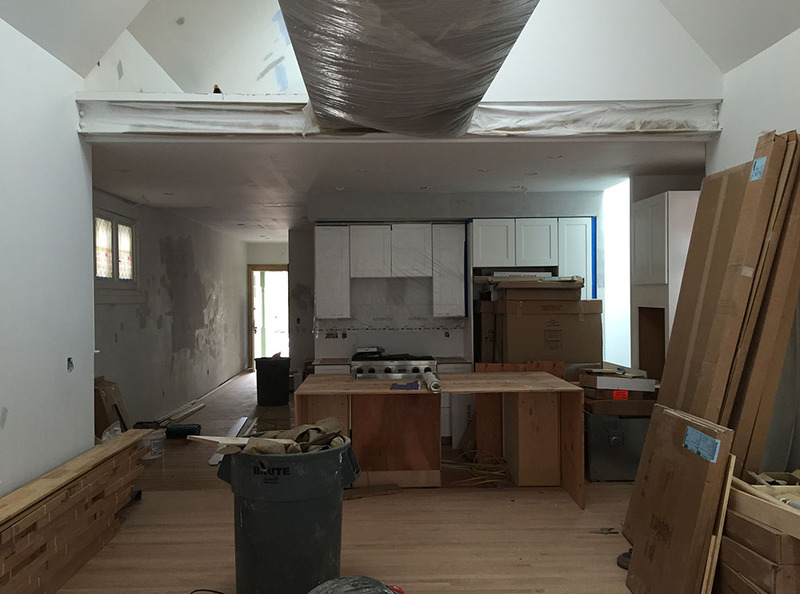 At the right side of the kitchen is the light shaft with a skylight at the top, and will have a glass panel to close it off but let light through. 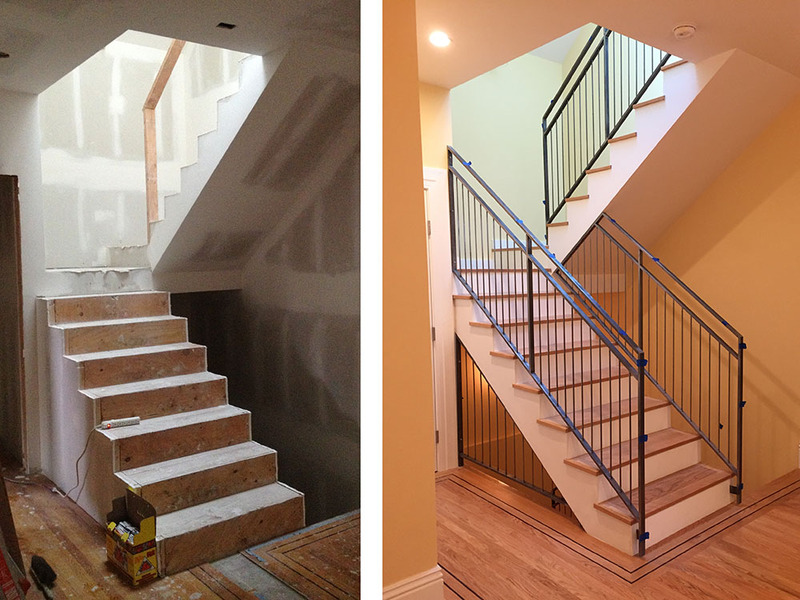 Here’s a look at the main stair that connects all 3 levels. 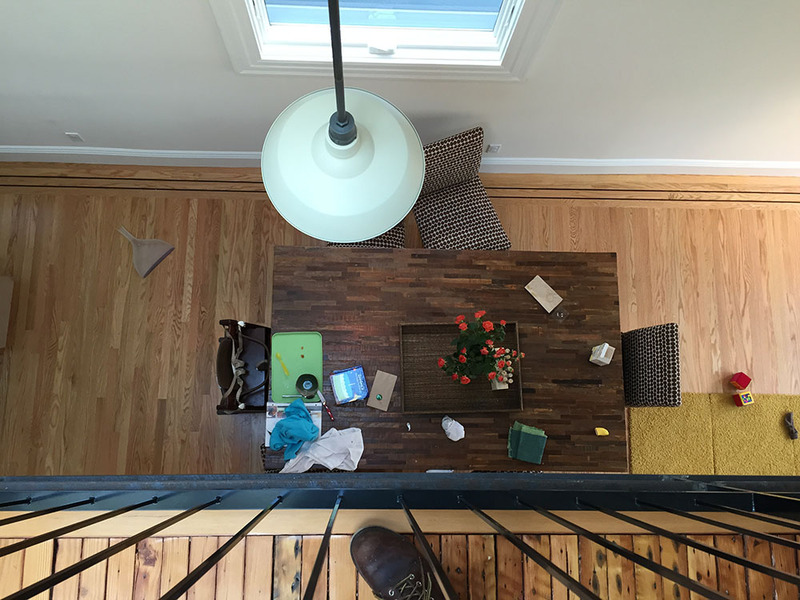 After we shifted the rooms around the old walnut floor border had to be redone to make sense in the new spaces. The lower stair was at first enclosed below but we decided to open up the triangle of space to let some light through as you walk down that lower run. 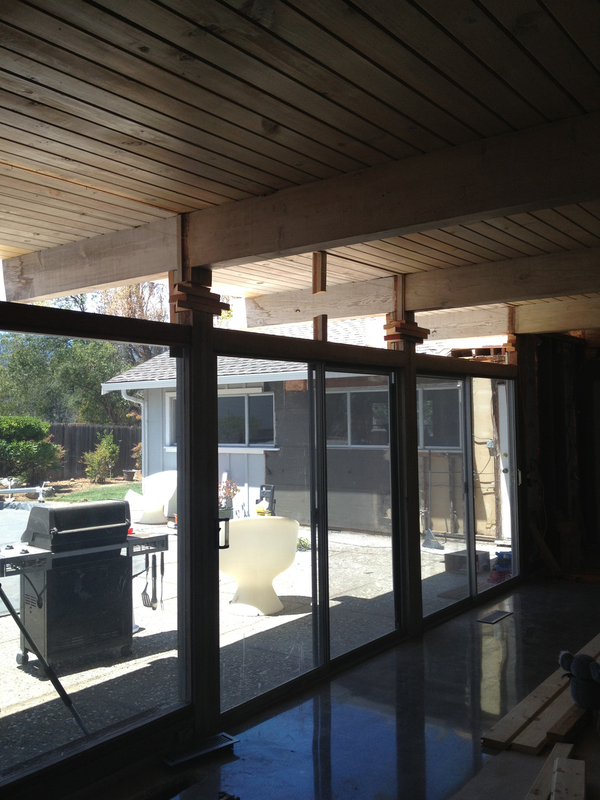 The steel railing is in place in the photo but the wood hand grip isn’t in yet. 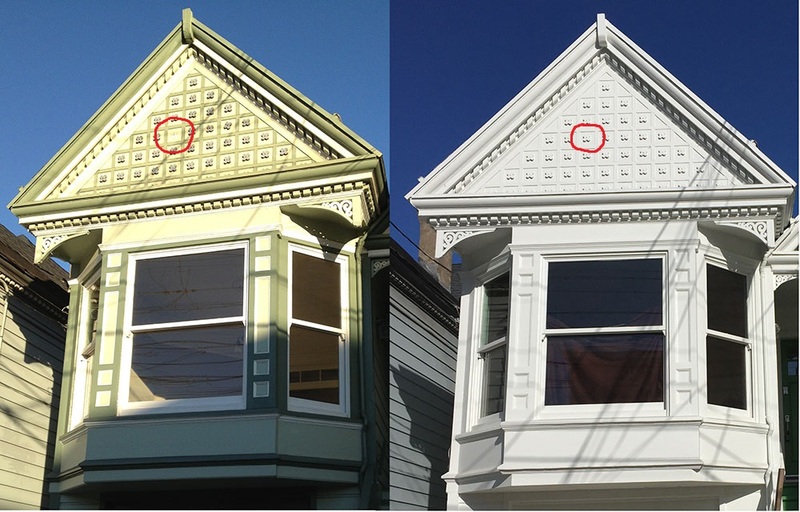 On the left I’m holding up old wood casing against two windows that meet in the corner…clearly we couldn’t use this 6″ wide trim – we went with a flat stock. 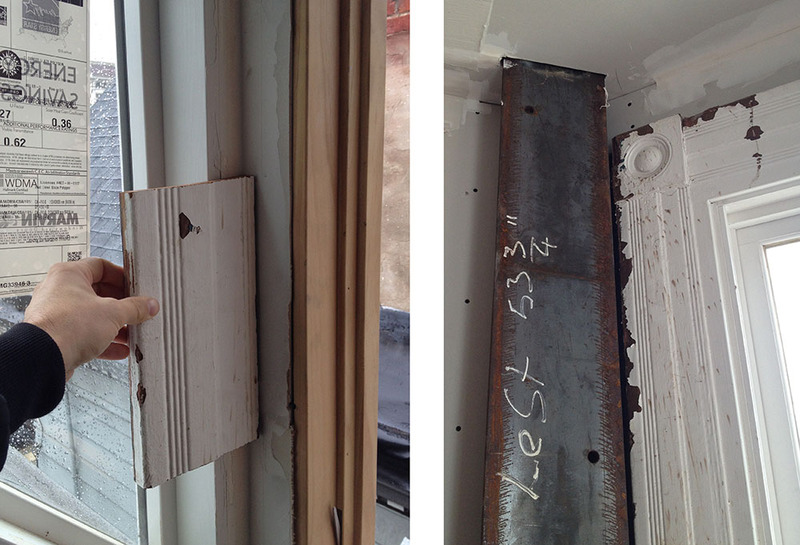 On the right is a steel post, part of a moment frame at the front of the building that we left exposed right next to the original wood window trim. We like the contrast! 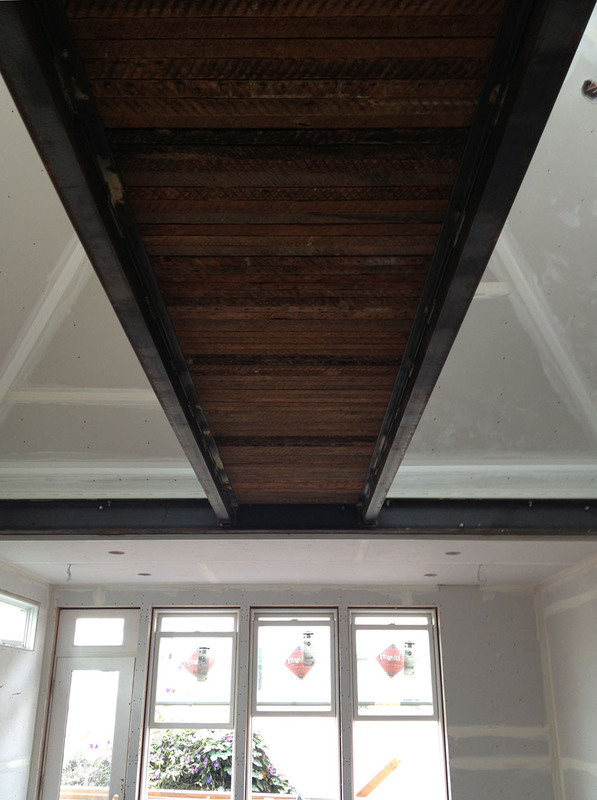 I was thrilled that these clients were as excited as I was to leave the unfinished steel exposed. I’ve tried to work this into a few projects but it’s often been covered up. Who doesn’t want a hulking steel beam in their house to brag about? Fast forward a few weeks, this is a view looking up at the bridge and loft, with a nice round barn light in the foreground. Here’s a view looking out along the bridge once the owners have moved in. The guard rails were custom-built by a local fabricator, with 1/4″ x 1/4″ solid square pickets. 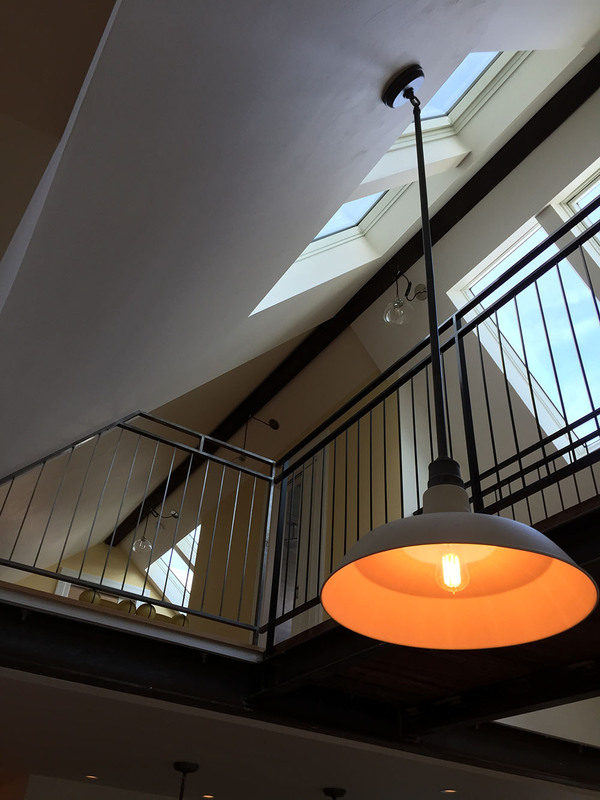 The pendant lights along the bridge hallway were powered off to one side, so we wouldn’t have to run wiring through the center ridge beam. The lights are just swagged over and hung off the beam by a hook. And a view looking over the edge past a barn light down to the dining table. Below is a partial exterior view; nothing much changed at this facade since it is ‘potentially historic’. The one change we did manage to sneak in was to replace a missing wood ‘flower’ ornament that the owner noticed upon moving in! See in the red circle – it’s back in place! I encouraged the owners to go with a monochrome paint color; originally tried to get them to do black or dark grey but I’m happy with the sugar-cube look as well. Stay tuned, portfolio shots coming soon!